Not everybody knows that Senator Joni Ernst--the Harley riding, heat-packing combat veteran who is Iowa's first female U.S. Senator--spent time on a collective farm in the Ukraine. No, the future senator wasn't colluding with a foreign state. Ernst was part of an Iowa Peace Institute agricultural exchange program. She was chosen to go to the Ukraine, then still a part of the old Soviet Union. Although Ernst had grown up on a farm in Iowa, helping the family out by doing chores (yes, including the famous one: helping castrate pigs), she found living conditions in the Ukrainian collective far different from those in the more prosperous U.S. She also found people yearning for the freedoms Americans sometimes take for granted. Speaking of the people she met in the Ukraine, Ernst would later say to a reporter that they were "folks [who were] begging for freedom and they just so badly wanted to know what it was like to be an American, to have the same rights and privileges and opportunities that we did." The stint on a collective farm turned out to be a life-changing experience for the Red Oak, Iowa native. Ernst's father, Richard Culver, and many other members of the family had served in the military. Ernst had given that path some thought. But seeing life on the collective shoved her further in that direction, and she made up her mind because, "I thought, by being in the military, that would be my part in keeping such a tremendous republic alive and well." This meant driving convoys through the deserts of Kuwait and southern Iraq. "It was really hard when you have Iraqis swarming your convoys and trying to steal stuff off your truck," Ernst recalled for the Sioux City Journal. As more contractors were hired, Ernst's National Guardsmen became more engaged in security duties, such as would generally fall to the military police. "(Force protection) wasn't always a serious matter. Often the local Bedouins would find that their sheep or camels had crossed over the berm into Arifjan. Then the Roving Patrol or (Quick Reaction Force) would be called to chase them back over to the waiting herder. Some of the soldiers were even able to test their camel riding skills." After being elected to the Senate, Ernst retired from the military with the rank of lieutenant colonel. She had served 23 years. Ernst first ran for public office in 2004, when she was elected as Montgomery County Auditor, a position she held until being elected to the Iowa state Senate in January, 2011. In 2013 Ernst declared that she would run for the next year for the seat of longtime Iowa Senator Tom Harkin, one of the most liberal senators. Harkin was retiring. Ernst was a relative unknown, but quickly demonstrated that she is a natural politician. Gaffes from the Democrats also aided her candidacy. When asked about Ernst, Senator Harkin put his foot in his mouth early on. "I don't care if she's as good looking as Taylor Swift or as nice as Mr. Rogers, but if she votes like Michele Bachmann, she's wrong for the state of Iowa," Harkin said. This was a golden opportunity for Ernst, who quickly replied with a folksy zinger. "I was very offended that Senator Harkin would say that, I think it's unfortunate that he and many in their party believe that you can't be a real woman if you're conservative and female. I believe if my name had been John Ernst on my resume, then Senator Harkin would not have said those things," Ernst shot back. Harkin apologized, but he'd already given Ernst the chance to turn the tables and accuse the Democrats of sexism with a clever rejoinder. Ernst's Democratic opponent was Rep. Bruce Braley, who had represented Iowa's first district in Congress since 2006. Braley was nothing if not gaffe-prone. Most famously, Braley was caught describing senior Iowa Senator Chuck Grassley to out-of-state donors as “a farmer from Iowa who never went to law school.” Grassley wasn't the only Iowa Republican who revealed an unappealing vein of snobbery in Mr. Braley. The liberal Atlantic Monthly observed that Braley "[could] hardly hide his contempt for Ernst." He charged that she hadn't had the opportunity to travel around the state, as of course Braley, a multimillionaire businessman, had. What a rube! In the charm game, Ernst clearly had an edge. As The Atlantic added, "Braley’s message has been obscured by Ernst’s star power: A Harley-riding, gun-toting self-described 'farm girl' with a hardscrabble upbringing who served in Iraq as a National Guard commander." The effect of the ad was instantaneous. Racking up nearly 400,000 views on Youtube within the first 72 hours, the ad gave underdog Ernst instant name recognition, and she overtook Braley in the polls. The "Make 'Em Squeal" spot is widely credited with having won the election for Ernst, even though she was massively outspent. Why was the pig castration ad so effective, she is asked. Senator Ernst laughs and responds, "Because it is every day American and because it is exactly what I grew up doing. I grew up doing my part on the family farm and getting my hands dirty, and it was important to point out to Iowans that I was raised exactly the way they were. I was expected to do chores and doing these chores might make stomachs turn in other states. But we were a family. We came together and we did these things together. That's the difference between making ends meet and not making ends meet. I understand the challenges [faced by American families], and I understand it is okay to get your hands dirty." Ernst won the race 52 percent to 44 percent (there were several minor candidates). She is Iowa's first female senator and the first female combat veteran to serve in the Senate. As for Mr. Braley, he has been able to indulge his penchant for travel, only this time it's outside of Iowa, to Colorado for a fresh start with a Denver law firm. Many voters would have liked to have seen big spenders squeal a lot more when the $1.3 trillion appropriations bill--known as the Omnibus Spending Bill--was passed earlier this year. Ernst shares their frustration. "The Omnibus Spending bill was in itself an atrocity," Ernst tells IWF, "because there was so much stuff in it. There was just stuff that was put into the bill to entice people to vote for it." However, the Omnibus Bill did increase military spending. This was President Trump's justification for signing it. As a combat veteran, Ernst has a strong opinion on this. "Building up our military has been so very important," says Ernst, "so that was one aspect of the Omnibus Bill was positive because we have seen our military decimated over the last eight or nine years. We can no longer do that. When we are not providing our men and women in the military with the proper equipment, the proper tools, and the proper training enabling them to survive on the battlefield, we have failed as Americans. I am grateful Congress decided it was time to do that. Let's give them the latest technology that will keep them safe because in the end, if they are engaging our adversaries around the world, what we want to know is that they will return home safe and sound to their families. We have failed if we have not provided them this opportunity." Ernst serves on the Senate Armed Services Committee. She has staked out an opinion on one military issue that is at variance with that of President Trump. Ernst is in favor of transgender people serving in the military, if they meet the physical requirements. "If you were willing to lay down your life beside mine, I would welcome you," Ernst has said. 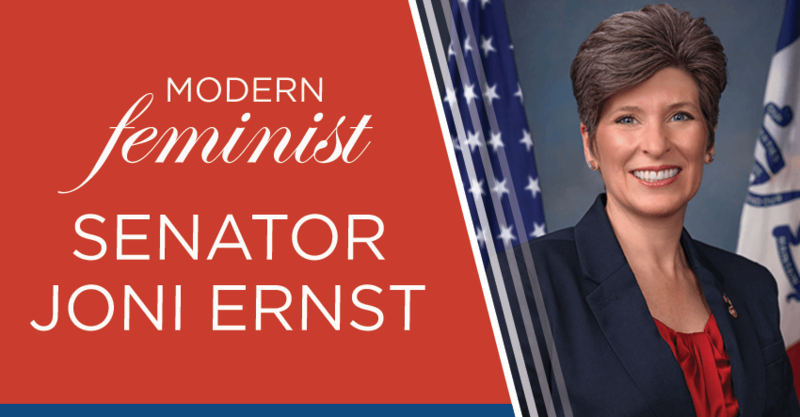 In the wake of the opening of all military positions to women, Ernst also supports women registering for the draft, a position that is at odds with that of many conservatives. Ernst has come to Washington at a time when there is an emphasis on electing more women to Congress (and other public offices) and on women's issues. Echoing IWF's position that "all issues are women's issues," Ernst says, "I am asked all the time 'What are you working on when it comes to women's issues? '," Ernst says. "My response is always 'Well, let's see I'm on the Armed Services Committee, so national defense--that's a women's issue. Equal pay for equal work in our workforce--that's a women's issue. Jobs and the economy--that's a women's issue.' Why do people try to separate men's and women's issues? As a conservative woman, I think first and foremost that we shouldn't be differentiating on what fits into this area or that area. I think we are all very concerned about jobs and the economy. I think we are all very concerned about national security. These are women's issues, and I think that where we are different from our colleagues on the left is that there are so many issues that are important all of us." Ernst is a co-sponsor of Nebraska Republican Senator Deb Fischer's equal pay measures, which would rely on tax credits and voluntary responses by businesses. "I believe in equal pay for equal work, so of course we want a fair shake," says Ernst. She also likes the IWF-backed proposal to fund paid leave through voluntary reliance on the Social Security system. A father or mother could take some of his or her Social Security early and defer retiring. Although Ernst quickly made herself one of the most recognizable members of the Senate, she seems to resist becoming a Washington sort of person. "The way I describe this, when folks ask me how much I like Washington, D.C.," says the senator, "is I say 'I like it so much I go back to Iowa every weekend. So I think one thing Washington has done is show me what a stark contrast it is being in the Beltway and being on what I consider regular, lovely, and beautiful America back home. Life is very different inside the Beltway and I think you will become very disconnected with what is going on in everyday America there. I certainly hear a different story and different concerns when I am back home in Iowa, coming from my neighbors, friends, and family, from what somebody who has lived in Washington for too long. I love going back to Iowa and I love visiting with the folks back home. They give me the real skinny on the issues, not Washington, D.C. So I'd like to think that Washington has not changed me, but it has certainly been an eye-opener. That is why it is so important for all of us serving in Congress to make sure we are going home as frequently as possible and hearing directly from our constituents." The senator's husband, Gail Ernst, whom Joni met as an undergraduate at Iowa State University, remains in Iowa and will join his wife in Washington on special occasions. It is a military family: Gail served as a command sergeant major in the Army, including: the Rangers, light infantry units and overseas in Saudi Arabia. Joni and Gail together have three daughters. When it comes to manual labor, the senator may be most famous for making pigs squeal--but that leaves out cleaning latrines in Kuwait. It seems that one day, a soldier spotted Ernst s driving a humvee, but not wearing her kevlar helmet. That was a no-no, so Captain Ernst gave herself latrine duty, which gave her soldiers a good laugh. Wait--can we see an ad coming on: the senator who cleaned latrines. Well, if so, it will just bolster the idea that Joni Ernst hasn't had her head turned by Washington and remains just like the (as she would likely say) folks back home, and folks across the nation who want to elect representatives who truly understand and respect their concerns.